I have a confession. I haven’t met many carbs that I don’t like; in fact, bread of almost any kind is a real weakness for me. Give me sourdough, give me pita. I’ll take a crusty rosemary and garlic boule, and I can flat devour a baguette. I’m partial to cornbread, and I’m a big fan of New York bagels. 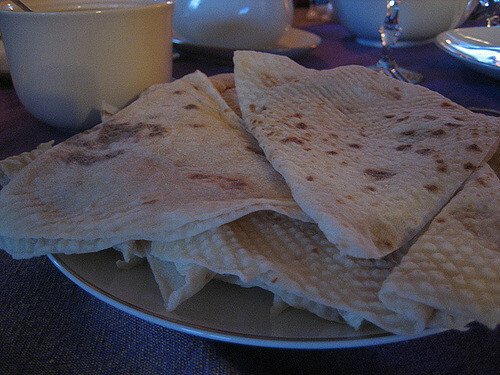 That said, there’s one kind of bread that tops them all: lefse. “What is it?” you might ask if you’re not from the upper Midwest or a Scandinavian country. It is, in my book, worthy of the title “Norwegian manna.” This traditional flatbread is a divine combination of riced potatoes, flour, butter, and cream that most closely resembles a crepe. To make it properly, you need a lefse griddle, lefse turners (long sticks), and a special rolling pin. 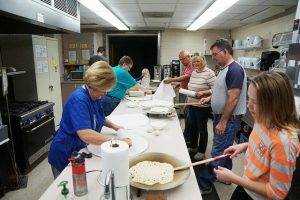 I first encountered lefse when serving a parish in North Dakota. My initial “What is it?” quickly dissolved into culinary bliss that has not dissipated. My friends know I have such a liking for lefse that one even sent us a case from Wisconsin to share at our wedding. Despite my appreciation of and longing for this labor-intensive and delicious treat, I do realize that one cannot live by lefse alone. It may be manna to the taste buds, but it’s not what I really crave. You see, like other things in life, lefse is evocative of something greater—a longing for community and belonging, for a place in the household and tradition. What we really crave is not lefse (or any other traditional bread, for that matter) but rather “soul food” that satisfies every molecule of our being. That comes from one source and one source alone: God. God has been in the business of feeding and satisfying hungry hearts and thirsty souls since the beginning of time. From the miraculous manna in the wilderness to the bread of life found in Jesus. Even in the bitter harvest of human discontent and the fallow season of murmuring, God’s provision is available to all people. Despite our seeming inability to name and understand our own basic needs, God is always there ready to fill our emptiness and nourish us deeply in the midst of our self-created scarcity. Think about it: For what do you really hunger? What would slake your soul’s incredible thirst and longing? Can you name it? Will you claim it? Can you at least acknowledge that gnawing hole at the center of your being that longs to be filled with God? Sure, lefse is lovely, and other foods may satisfy for a moment, but our real needs are met at Christ’s table in a crumb of bread and a sip of wine. A little bit goes a long way with Jesus. You can’t hoard it and you can’t hang on to it in order to keep others from having it, but this living bread is available to you—as much as you need—every minute of every day. Go ahead! Try it. Open your hands, eat, and be filled with the “what is it” from heaven that satisfies eternally. Consider how God has provided “manna” for your congregation, as well as “manna” for your individual discipleship journey. What is the “what is it” that you call manna in your context? How does it satisfy, providing enough and then some? Note: We are in week two of five weeks of “bread lessons” from John. If you are emphasizing a different type of bread each week, this week’s offering is lefse (or what I call “Norwegian manna”). Make some lefse and share the history. Here’s a traditional recipe. Here’s a video. Here’s a simple (cheater/heresy) recipe. Here’s a vegan and gluten-free recipe. Curious about manna? Check out this story. Consider this week’s gospel lesson with your youth. How do the people “miss the point” about Jesus by asking for a sign? Do we miss the point today about Jesus when we look for signs, for proof, and for ways that we can “earn” our living bread? How can we work with Jesus to make sure that the living bread from heaven is available to all people—as well as the “daily bread” we need to satisfy our physical hunger? We are One in Jesus! This is a great opportunity to talk with children about unity and being one in Jesus. Collect pictures of children from different cultures and ethnicities. Share them with the children and if possible show where the children might live on a map or globe. Ask the children what they notice about the pictures of the other children. What do they see that’s similar? Are there more similarities than differences? Tell the children that we are all one in Jesus. We are all called to be followers of Jesus, and that means that we are humble, gentle, patient, and loving. We support one another. We work for peace, and seek to be united. We all have different gifts. We come from various places, but in Jesus we find our unity. If you have time, help the children make braided friendship bracelets to share, reminding them that we are woven together in one big family—God’s family. Here are some easy instructions using a simple cardboard loom. (Note: If time is an issue, provide kits for the children to take home. Provide enough supplies for them to make one to keep and one to share.) Finish with a simple prayer for unity. What is it, this manna, this bread from heaven? It’s Jesus, of course—always unexpected, ever-faithful, and continually surprising and amazing. We are stewards of this bread of life, called to invite others to come to the table and dine. Consider baking bread or making lefse as a household activity this week. If you live alone, gather a group of friends for a bread and butter party. Invite each person to bring their favorite bread and topping. Spend some time reflecting on the goodness of daily bread and why each person likes the particular bread they brought. Consider raising money for a hunger advocacy group or check out Bread for the World’s website and add letter writing to your bread and butter party. Photos: Lance Fisher amd Grace Lutheran Church, Creative Commons usage license. Thanks!